NTSC compilation bought on eBay. Features (mostly) good quality clips in rough chronological order. NTSC compilation bought on eBay. Features (mostly) good quality clips, and clips featuring George (but not by him) and related artists. 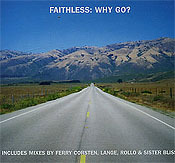 Boy George with Faithless - Why Go? NTSC compilation bought on eBay. 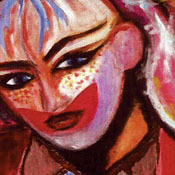 "Top Ten" (Documentary Series) 3/13/99: This episode profiles the "Top Ten" 80's Romantics. 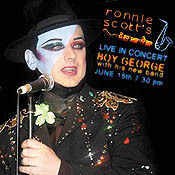 Boy George hosts this entire show. 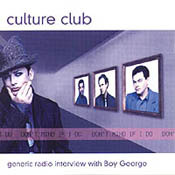 This segment includes George's introduction and segment following of Culture Club. NTSC compilation bought on eBay. Australian TV footage from 1984. NTSC compilation bought on eBay. Footage from 2000-2003. Access Hollywood 5/6/03: Taboo is discussed at the Premiere. Rosie O'Donnell is interviewd with Boy George. NTSC compilation bought on eBay. Footage from 2000-2007. 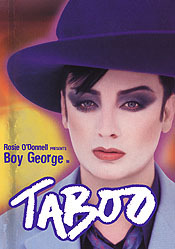 Live with R and K 10/30/03: Interview with Boy George, promoting Taboo on Broadway. 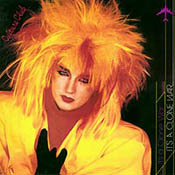 Top 100 Songs of The 80s 10/2006: Do You Really Want To Hurt Me at #58. 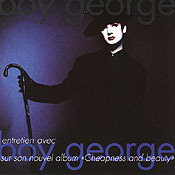 Biography Boy George 10//11/07: In Depth interview and profile. 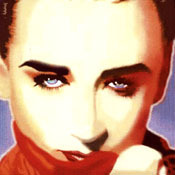 Profile of the Culture Club star who shocked the world with his flamboyant androgynous style. 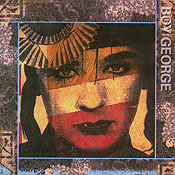 Born George Alan O'Dowd into a working class Irish family, Boy George ruled the 80s music charts with such hits as Do You Really Want to Hurt Me? and Karma Chameleon, but soon fell into drug addiction. He disappeared from public view until 2006, when he was busted on a drug charge and had to perform community service with the New York City Department of Sanitation. 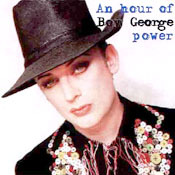 Third Annual Beverly Hills Free Festival, USA, 1990 - event in aid of a youth centre in Los Angeles - audience recording (19 minutes): Generations Of Love, Victims, Bow Down Mister, Boy George receives a birthday cake and a certificate. 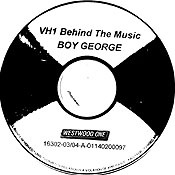 Entertainment Tonight - Inside Music, 1990 - news report featuring Boy George interview (1 minute). 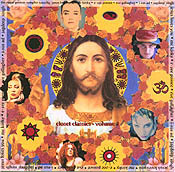 News, USA T.V, 1990 - news report on the premiere for the film Ghost, Boy George is shown arriving (1 minute). Saturday Zoo, Channel 4, UK T.V, 1992 (7 minutes): Get It On, Your Love Is What I Am. TV-AM, ITV, UK T.V, 1992 (7 minutes): interview with George and Hannah Jones, who George wrote "Strong Boy" for, and features in the video clip. Parallel 9, BBC1, UK T.V, 1992 - part 1 (5 minutes): performance of The Crying Game & interview, and reviewing new music videos. The Jim Davidson Show, UK T.V, 2000 - Boy George performs a dance version of Vanity Case (4 minutes). 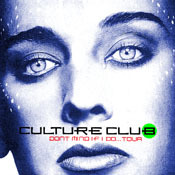 Culture Club live 1982 (10 minutes): Do You Really Want To Hurt Me, Church Of The Poison Mind. (cut), White Boy, Time (Clock Of The Heart). Mistake No. 3 (American Music Awards, 28/01/1985). Smash! 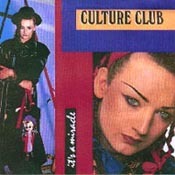 The Culture Club Story, Smash Hits Special (ITV-UK, 2002). various news footage from Chile & Siempre Lunes Chile. King Tut or George? - from 60 Minutes talking about how Egyptian King Tutankhamun's portrait looks like George! Bio channel's biography on Boy George, and other misc. bits and pieces. Japanese TV special from 2002-03, hosted by George and his scenes filmed in his house. (NTSC-region free) (includes custom-made artwork) 2-DVD set featuring an audience recording of the last performance of Taboo on Broadway, and various TV appearances, promo reels etc. all relating to Taboo's Broadway stint! TABOO on Broadway - audience recording of final performance of Taboo on Broadway, picture and sound quality is good considering it's a bootleg. 'Behind The Scenes' promo - features mini reports of how Taboo was put together, costume sketches, rehearsals and press conferences, concludes with the 'Out of Fashion' video clip featuring footage from the UK production. 'Promo Reel' - 20 minutes approx. professionally shot footage of Taboo on Broadway, snippets of most songs from the production. The View - performances by Brooke Elliott ('Talk Amongst Yourselves') and Euan Morton ('Pretty Lies') taped from US talk-show 'The View'. Concert at Yokohama Stadium, Japan, in August 1985 - as televised on Japanese TV. 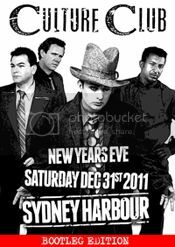 Australian TV footage leading up to, and including, Culture Club's full concert in Sydney on New Year's Eve, 2011. 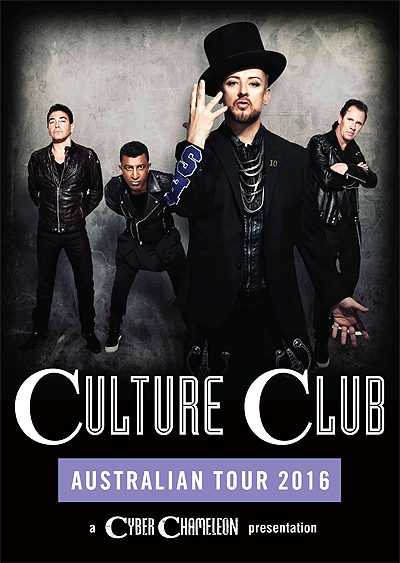 Main Event (with Guy Sebastian) ad. 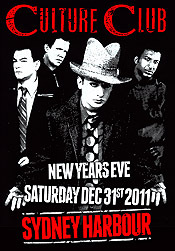 Audience footage of Culture Club's concert in Sydney on New Year's Eve, 2011. 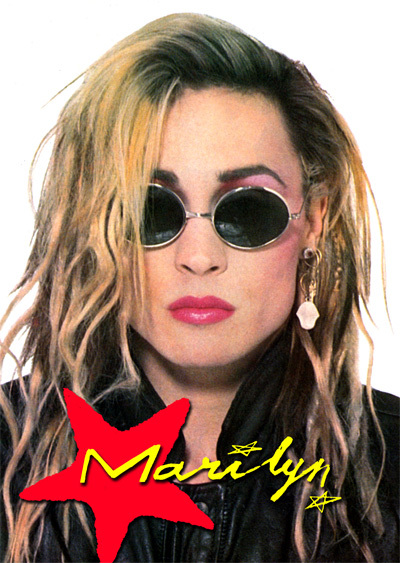 3-DVD set of Marilyn video clips, appearances and interviews. 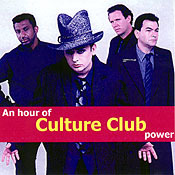 CD-R copy of Virgin's promo CD of the Culture Club press conference, held on 29 Sept 1998, to promote the upcoming VH1 Storytellers/Greatest Moments CD set, their reunion etc. Features all members of the band though George does talk more than the others! 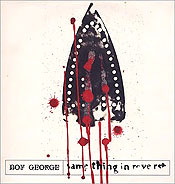 CD-R bootleg of George's live gig at Ronnie Scott's Jazz Club in London, very good/clear copy. 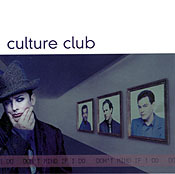 Promotional single edits put together by Virgin Records to promote the Culture Club box set. 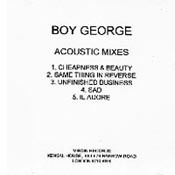 It's the VH1 Behind The Music special - (slightly) formatted for the "VH1 Radio Network"
'Acoustic Mixes' are acoustic versions of some of the songs from George's 'Cheapness and Beauty' album, put together on CD-R by Virgin to promote the album in 1995. 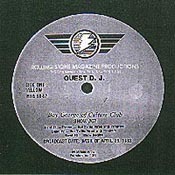 Direct copy from the promo CD-R.
A Guest-DJ program from early-83 (around the time Time/I'll Tumble 4 Ya was released in the US). Converted to CD from the actual promo record. 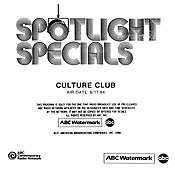 ABC Spotlight Special on Culture Club - air date June 17, 1984. Includes interview with George, Jon, Mikey & Roy. Converted to CD direct from original promo record. Show: #NBC 84-10. 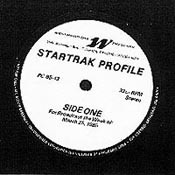 Direct copy from original promo record. 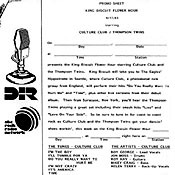 Westwood One Presentation on Culture Club, for broadcast the week of March 25, 1985. Features interview with George. 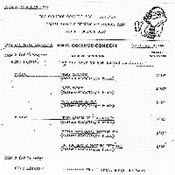 Direct copy from original record. 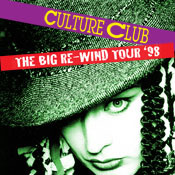 Bootleg of Culture Club's concert at Meadowlands Arena, East Rutherford, New Jersey, November 12 1984. 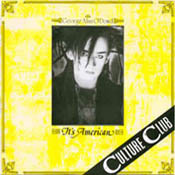 2 CD set, taken directly from original 2 record set. 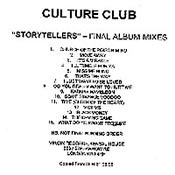 Copy from Virgin's CD-R acetate of the Storytellers concert. 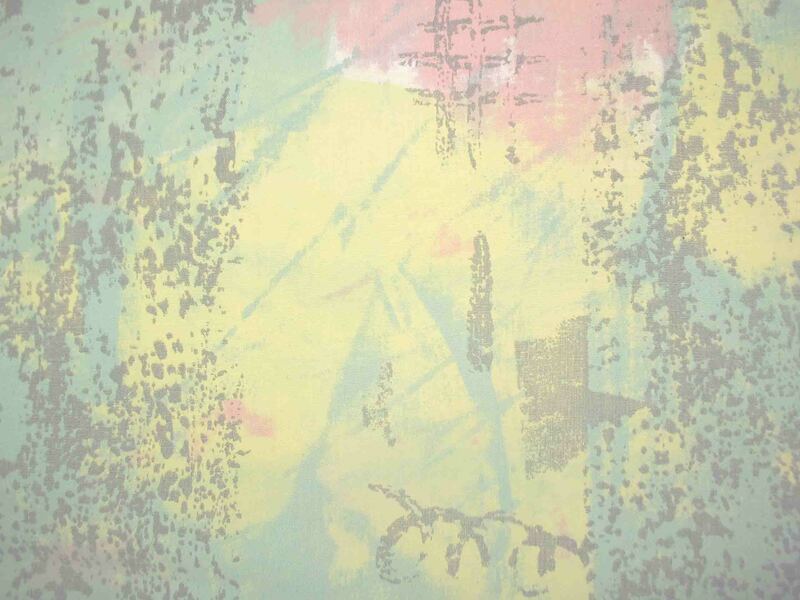 Features snippets of faded in/out conversation at the beginning/ends of tracks. Side 2 of BBC's College Concert #30 (side 1 featured Dexy's Midnight Runners), week of April 17, 1983. 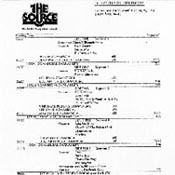 Direct copy from original record. Direct copy from original record, a bootleg of a 1983 Japanese concert. 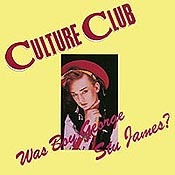 Was Boy George Stu James? 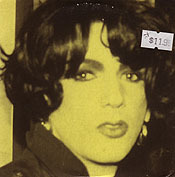 Direct copy from original record, a bootleg of a 1983 concert at the Lacium Theatre in London. Direct copy from original record, a bootleg of a 1983 concert at the Hollywood Palladium. 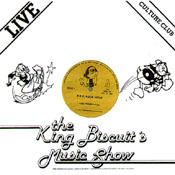 Direct copy from original promo record, a BBC Presentation from the week of November 27, 1983. Direct copy from original promo record - ABC Rock Radio Network, also featuring the Thompson Twins. Live in Seattle, for broadcast April 17, 1983. Hour-long medley of 50 Boy George solo hits, album tracks and b-sides, put together by Adrian from Lyrically Speaking / Cyber Chameleon. 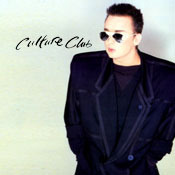 Hour-long medley of 40+ Culture Club hits, album tracks and b-sides, put together by Adrian from Lyrically Speaking / Cyber Chameleon. Remixes made and featured on Cyber Chameleon in the early 00s. 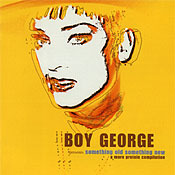 1995 CD single written/produced by Boy George & John Themis. 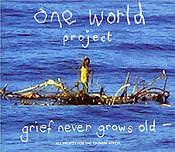 1995 CD single - UK release. 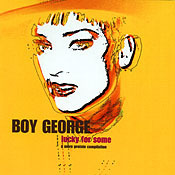 1999 CD single - UK release. 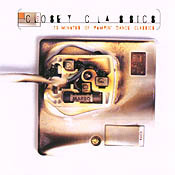 2005 CD single - UK release. Features George, Cliff Richard, The Bee Gees, Brian Wilson, and others.